:Coaching is all about relationships, with the people coaches lead, fellow coaches, family, and God. The Heart of a Coach Playbook helps strengthen a coach's personal relationship with Christ while modeling biblical integrity to the players on their team and the people in their lives. This collection of 31 devotional readings, written by current and former coaches, uses realistic coaching situations and Scripture references to encourage and equip coaches on the issues they face in their daily lives, including character, faithfulness, persistence, and commitment. Readers will be introduced to the FCA devotional method, "PRESS," designed with athletes in mind: Pray, Read, Examine, Summarize, and Share. 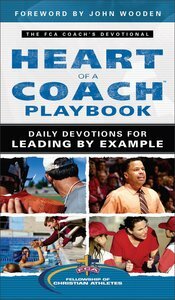 About "The Heart of a Coach Playbook: Daily Devotions For Leading By Example"